Acupuncture involves the insertion of very fine, sterile, single use needles into the skin, at specific points on the body, for the purpose of treating various disorders. The human body is permeated with and surrounded by fields of Qi (energy). Qi moves throughout the whole body but in certain defined pathways. These pathways or channels are call Meridians. The Meridians or “energy pathways” of Oriental Medicine are intimately related to these energy fields. The insertion of needles stimulates the energy at these acupuncture points thus restoring and regulating the natural flow of Qi through these meridians. This promotes optimal health within the body. Each acupuncture point has a unique location. Each acupuncture point has specific needling instructions based on depth of needling and angle of insertion. Also, each acupuncture point has a particular action and indication, as well as special combinations to enhance its effect. Acupuncture works with the body’s innate ability to heal itself; once pathways have been unblocked, the body’s natural healing response can take place. Explaining how acupuncture actually works is not an easy task. Traditional acupuncture is based on ancient Chinese theories of the flow of Qi (energy) and Xue (blood) through distinct pathways or meridians which traverse the body. When these meridians are activated, by the insertion of needles into acupuncture point, the proper flow of Qi is restored, enabling the body to heal itself of illness and to reach optimal well-being. Scientific studies have documented acupuncture’s effects, but they have not been able to fully explain how acupuncture works within the framework of the Western system of medicine. Acupuncture points are believed to stimulate the central nervous system (the brain and spinal cord) to release chemicals into the muscles, spinal cord, and brain. These chemicals either change the experience of pain or release other chemicals, such as neurotransmitters and hormones, that influence the body’s self-regulating systems. Acupuncture can increase blood circulation, relax muscle spasms, reduce pain, and stimulate nerve activity. These biochemical changes may stimulate the body’s natural healing abilities and promote physical and emotional well being. Is Acupuncture safe and painless? Acupuncture is extremely safe. It is a “drug-free” therapy, yielding no side effects except feelings of relaxation and being grounded. For your safety, only sterile and disposable acupuncture needles are used. These pre-packaged needles are only used once and disposed of after each use. While most people express fear or anxiety of needles before their first visit, they are surprised by the pleasantness of the acupuncture treatment. Unlike hollow hypodermic needles used for injections, acupuncture needles are solid throughout and are very fine, about the thickness of a human hair. There should be very little or no discomfort with needle insertion. The typical description includes feeling a slight pinch or pressure. You may then feel a slight sensation as the needle contacts the Qi. This is called the “De Qi” sensation. (This is how acupuncturists engage the Qi in your body in order to help balance it.) This sensation can vary from a vague numbness or heaviness to a tingling or dull ache. Sometimes you may experience the sensation of energy or warmth spreading from the needle. In some instances the sensation travels along the path of the meridian and can affect whole areas of the body or limbs. All of these reactions are a good sign that the treatment is working. 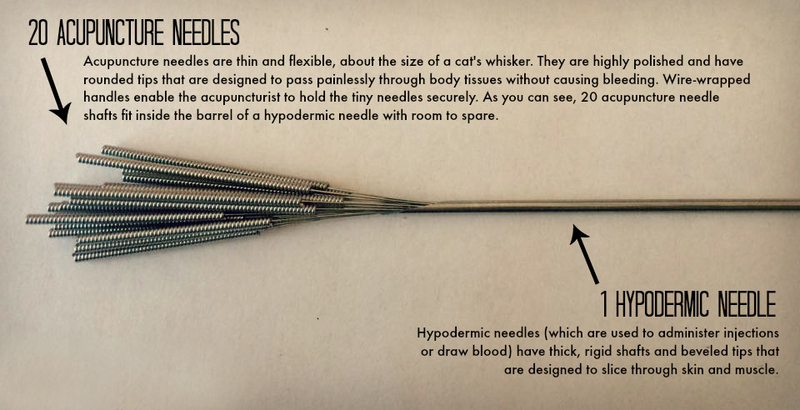 There is no marking on the skin after the needles are removed. We take great care to ensure that you are very comfortable so that you can relax while the needles are in place. The more you can relax during an acupuncture treatment, the better the results. Many people experience a deep sense of release and relaxation during and at the end of the acupuncture treatment. No. Acupuncture works whether or not you believe it will work. Acupuncture treatments have been given successfully to animals and children, and while they may not understand or believe in this process, their health and condition improves regardless. Though a positive attitude helps with any type of therapy, it is not necessary to believe in acupuncture or Chinese Medicine (or to feel it working) for it to truly be effective. Since positive expectations and beliefs in a particular therapy help to increase therapeutic results, we encourage you to raise any questions, concerns, or doubts that you may have about acupuncture and Chinese Medicine. We would like to help you better understand acupuncture and Chinese Medicine so that you may have the most positive healing experience possible. You are invited to contact us today and we will personally respond to any questions or comments promptly. How many acupuncture treatments would I need? It is important to note that everyone responds differently to treatment and so it is often difficult to be specific about how many treatments are necessary. A good rule of thumb is that the more chronic a problem is, the longer the course of treatments. Likewise, the more serious the condition is, the more frequent the treatments should be. Lastly, acupuncture is as much a system of prevention as it is a cure. So regular treatments, whether weekly, monthly, or seasonally, are sometimes recommended for maintenance of overall well being. In general, we tell patients they should start to feel the benefits from acupuncture within 2 to 3 treatments. If the problem is acute, sometimes improvement is felt after the first treatment, and may only require 2 to 3 more treatments to resolve. But if the problem is chronic, it may take more treatments to fully resolve the issue. Typically patients are treated once a week. If the condition is acute and painful, treatments should be twice a week for the first couple of weeks or at least until the symptoms are under control. Then treatments can be spread out to address the chronic nature of the root cause of your condition. The benefits of acupuncture treatments have a compounding effect and tend to sustain for longer periods of time as you receive more treatments. What can happen is that you will require fewer treatments or less frequent treatments. After a successful course of treatments, you may only come in periodically for maintenance or to address other conditions that were not as problematic. The first treatment will take about 90 minutes and is our opportunity to get to know you better. We will complete a detailed intake in order to learn more about your symptoms and determine how they may be interrelated. Even the smallest detail may shed light on the root cause of your condition. In addition to listening, discussing your symptoms and concerns, a Chinese Medical examination will be conducted which involves observation and palpation. Specifically, we will be visually examining the tongue, qualitatively feeling the pulses on the wrists, and palpating certain meridians. Then a Chinese medical diagnosis will be given and a treatment plan will be suggested which may include acupuncture, Chinese herbal medicine, diet therapy, exercise, and other adjunctive therapies. This will also be the time where you can ask questions and receive informative explanations so that you are comfortable with everything before treatment begins. Most health insurance companies do cover acupuncture treatments. Meridian Therapeutics is a preferred provider for many health insurance companies. If you prefer, we would also be happy to verify coverage and benefits for you. How do Chinese herbal medicines differ from western herbs or pharmaceuticals? Western Herbal Medicine tends to use one or two herbs to treat just a specific symptom. Chinese Herbal formula contain as many as 20 different herbs. Chinese herbs are selected to work synergistically to treat the whole person. In Chinese Medicine, we assess a person’s entire constitution (the health of their whole body) and treat the root (or cause) of a health concern along with a branch (or the symptoms) of that health concern. It is in this way that we are able to treat a person’s whole body and mind, rather than just a symptom. Western pharmaceuticals typically address one symptom or condition as a whole. They do not address the root cause of the problem or multiple symptoms concurrently. More often than not, the synthetic drugs you may take will cause side effects or adverse reactions. These side effects or adverse reactions are then treated with more drugs. And if your primary symptoms were unsuccessfully treated, a higher dosage or another synthetic drug is typically prescribed. With side effects building up and problems being compounded, Chinese herbal medicine is a safer alternative. Chinese herbal formulas tend to be much gentler than western medicines and work not only to help relieve symptoms, but to help return the body to its natural balance so that herbs will not be needed for a prolonged period of time. That is why your Chinese herbal formula will be modified as treatment continues. With treatments, the body naturally starts to shift towards a healthier state, and therefore the herbal formula is modified to meet the changing demands and conditions of the dynamic body. If you are currently taking western prescription medications, your Chinese herbal formula will be carefully formulated and checked for contraindications. Also, your prescribing physician can be consulted if you would like. Please keep in mind that complex conditions would have to be carefully evaluated on a case by case basis.